Happy Wednesday! We've been having some real dreary weather lately, hence the grey outfit - to go with the spirit of February so far - haha! We did wake up to some sun today, but it is super cold still. It's okay though, I'll just sip on a hot coffee indoors until then. I know tomorrow is Valentine's Day, but my husband and I don't really celebrate it too much. We don't go anywhere fancy or buy each other gifts. Not that there's anything wrong with that if you do. We just don't really want added pressure around this day, so instead we get each other small things throughout the year. It is a sweet day though and I think anything that bring positivity and happiness into people's lives is worth doing. If it brings you joy, go for it! Hey Madeline! Glad I found your link up! I'll add it to my weekly list. Love the grey blazer! We don't celebrate Valentine's Day either. Your blazer is fabulous! you rock the grey! 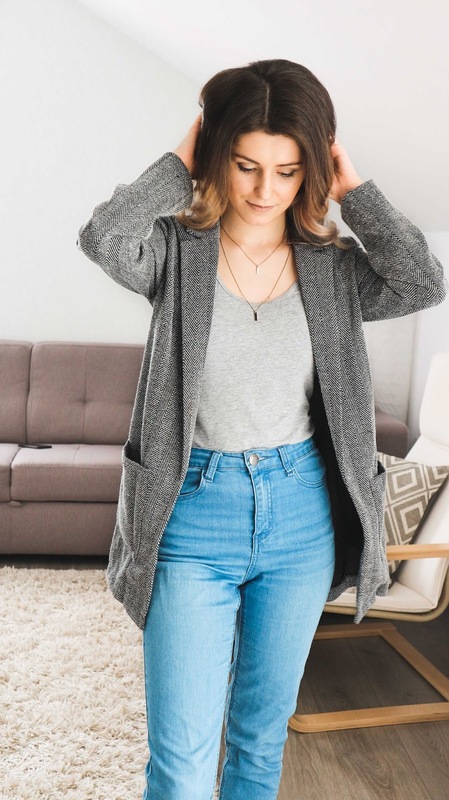 cute cardigan! February has been dreary. It has been raining a few minutes ago here and it's just hard to be motivated with taking any photos or really getting dressed at that! Love this casual and cozy outfit. You can't go wrong with grey either. It's a season less color in my opinion. Hi! And I'm with you on the dreary day...it slows my productivity down at times too. Your cardigan looks so cozy. I love it! I like everything in your outfit, Madeline! Great look! Thank you very much for stopping by my blog. I am glad found your link up! I will join it next week! Our anniversary is tomorrow, so we will go out to breakfast to celebrate. It's not as crowded that way and we still can spend time together!! I love your outfit..it's so cozy! Thank you, you're so kind. Super cute everyday look. Loving the blazer with a tee look! This blazer is such a great piece, doll! They seem to be such good quality. I haven't had them for too long, but I bet they'll last me.